This is the second installment in a 4-part series. The first installment can be found here. The end of Shadowboxing’s lower crux section. Photo Mike Anderson. 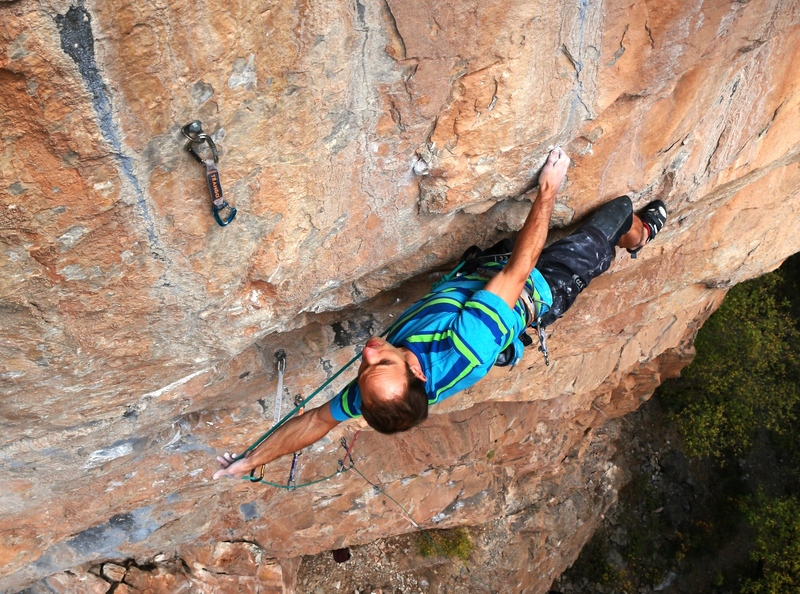 By the end of the Fall 2015 climbing season, I was consistently 2-hanging the route, and while my hang points were converging, the rate of improvement was glacial. Clearly I needed to reach another plane of endurance capability. 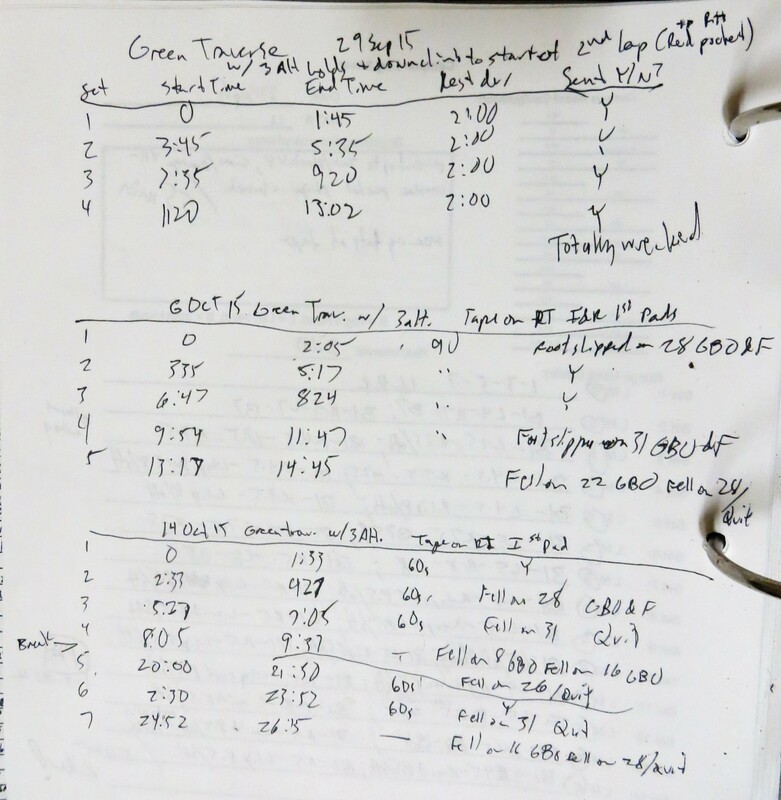 Early in the season I was training Power Endurance (PE) by completing four sets of my standard “Green Traverse” Linked Bouldering Circuit (LBC)—approximately 32 moves, on terrain that varied from 35 to 60-degrees overhanging. It would take about 100 seconds to complete a 32-move set, and then I would rest some pre-determined period before attempting the next set (and so on, until I had completed 4 sets). As my endurance improved, I increased the intensity by (first) reducing the rest time between sets, and then by adding more sets. By the end of the season I was doing 5 or 6 sets with just 60 seconds rest between sets, but my endurance was still nowhere close to sufficient for Shadowboxing. My standard, 32-move “Green Traverse”. I knew from reviewing terabytes of video of myself on the route that I would need to be able to endure 150 to 180 seconds Time-Under-Tension (TUT), just to climb between rest stances, where I would need to be able to recover, and then sprint another 100+ seconds of consecutive pumpy moves, and so on. To climb all the difficulties without a hang would take 250+ seconds of just climbing, plus many minutes of taxing shaking at rest stances. Clearly hammering more and more 100-second laps on my trusty Green Traverse wasn’t working, and I think the lack of continuous TUT was the reason. My PE Log sheet from the three workouts I did using the standard Green Traverse during the Fall 2015 season. 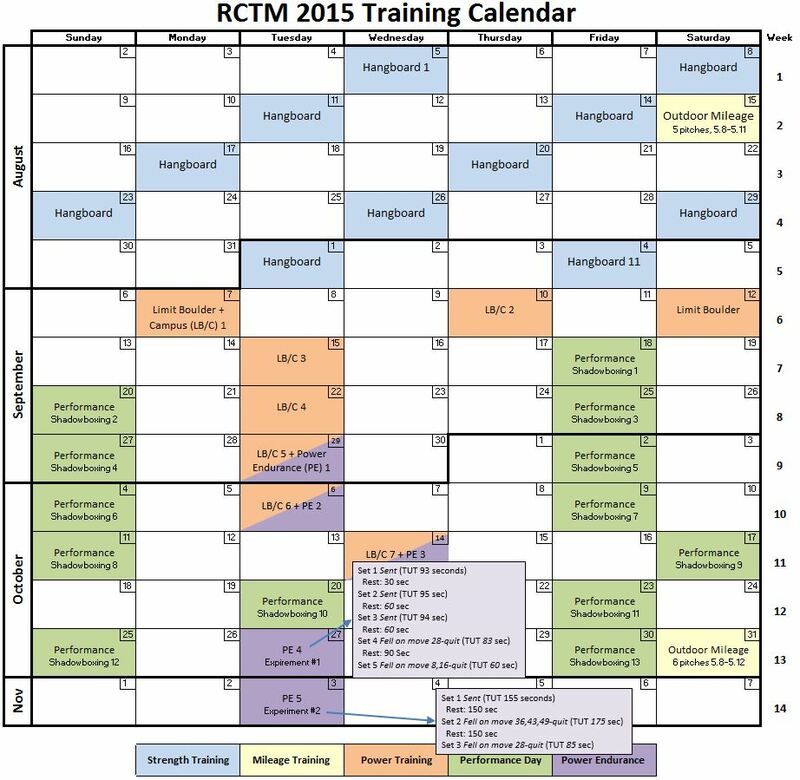 My Fall 2015 training Schedule, showing the programming of my PE workouts and my two PE experiments. Still, I considered the experiment a success. First, it showed the workout timing could be a good stepping stone for a climber who didn’t yet have the endurance to complete a single set of a given circuit. 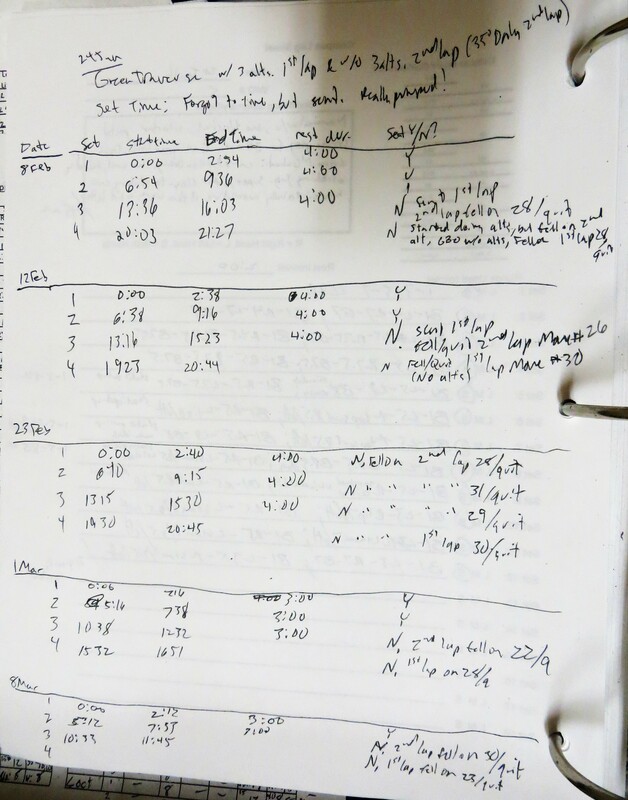 Second, from a personal perspective, it showed I was likely ready for much longer sets. 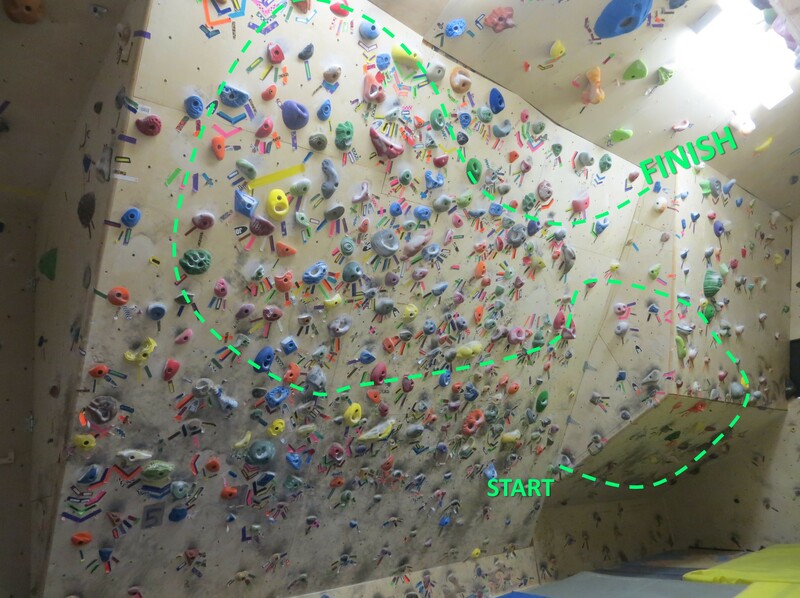 In preparation for that, I built a down-climb at the end of the existing Green Traverse that rejoined the circuit about 12-moves in, thus allowing for a 52-move set. This new set required around 150 seconds of TUT—just what I needed. The pink line shows the extension to the Green Traverse, brining the hand-move count to 52. I wanted to have a firm endurance-training strategy that I could believe in before I completely wrapped up my Fall season, so after my last Rifle weekend I did one last PE workout to iron out the kinks in my new, longer circuit. I was able to send the first 52-move set, but the next two were pretty rough, and it was clear I was hitting a wall around 105 seconds into each set. Even on the set I sent, I pretty much cruised the first 100 seconds and struggled on the last 50. My goal for the winter season, in addition to sending some outdoor projects near home, would be to hone my power endurance. In total I did 5 PE workouts that winter, consisting of (attempting) 4 sets of the new 52-move circuit, with TUT ~150 seconds per set, and a 4-minute rest interval. 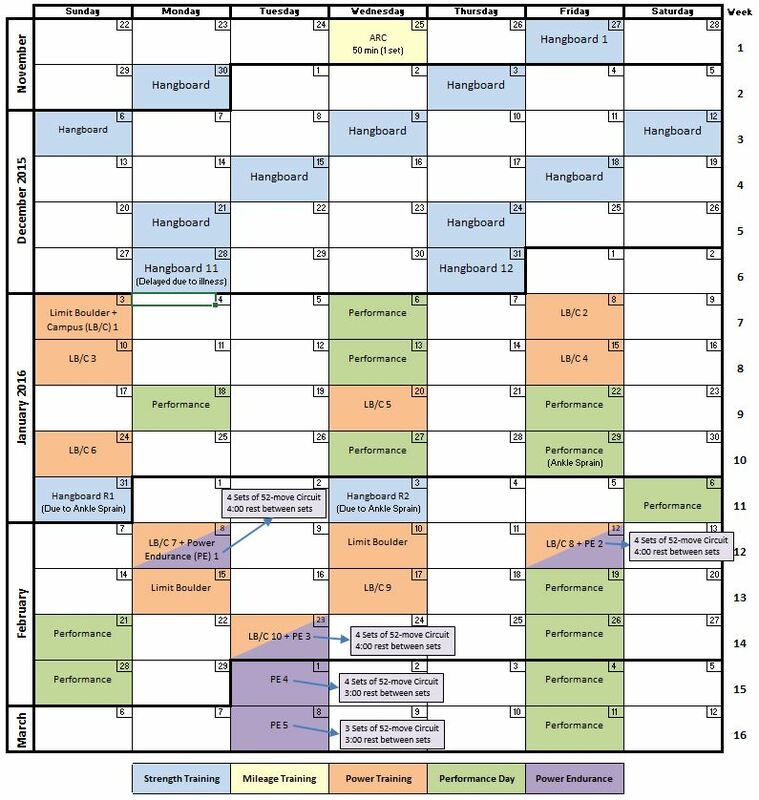 My Winter 2016 training Schedule, showing the programming of my 52-move circuit PE workouts. I struggled with these workouts. I never once completed every set, or even the first three sets. I was close at times, often failing very near the end of each lap. During the fourth workout I crushed the first set, and so (somewhat foolishly) decided on-the-fly to drop the rest interval to 3 minutes. That resulted in sending the 2nd lap, failing near the end of the 3rd lap, and mid-way through the 4th lap. Still, it was pretty comparable to my first two workouts in terms of performance, which provided good data points on my improvement, and the qualitative difference between the 3 and 4-minute rest intervals. Even though I never sent the workout, I could tell my endurance had improved considerably from the end of the Fall 2015 season. More importantly, I felt like I had solved the problem of how to improve my endurance—I now had an effective training circuit that I could use to prepare for my next bout with Rifle. My PE Log sheet from the winter 2016 season. My hangboarding that April was outstanding, I set Personal Records (PRs) on three grips, and tied PRs on two others. As May arrived, my Power Phase went just as well, quickly matching my hardest Max Ladders on the campus board. What surprised me most was that I seemed to carry-over much of the endurance I had gained over the winter. During my first PE workout of the season I sent the first three laps of the 52-move circuit for the first time (with 4:00 rest between sets). It seemed like everything was coming together perfectly. I was brimming with confidence and buzzing with anticipation. Surely I could send the route if everything went as planned. Hi, Mark! Thank you so much for sharing (once again) your workout with us. I really liked your approach regarding the specificity of the number of seconds between rests on your goal route and I’m really eager to try that. However, I also read in the holy bibl…, I mean, your book that you guys try to mimic the climbing on the rock on your PE workouts by respecting a realistic number of seconds in each move (I try to reach an average of 4.5 to 5 seconds per move). From your post I read that you are spending an average of 3 seconds in each move. Could you clarify this point? You’re the best!!! Thanks for the post!